In August 1914 the 1st Battalion Bedfordshire Regiment were amongst the small professional British Army who gathered and prepared for a war that would ‘be over by Christmas'. Unfortunately, due to sales rights restrictions, we cannot offer 1st Bedfordshires - Part One for sale in your country. In August 1914 the 1st Battalion Bedfordshire Regiment were amongst the small professional British Army who gathered and prepared for a war that would ‘be over by Christmas'. With a long and proud history, dating back to 1688, the regiment's fighting men had already served through numerous wars and rebellions over and above long periods on garrison duties in the ‘Fever Isles', the New World, and throughout the expanding British Empire. So when war was declared the ‘Old Contemptibles' of the 1st Battalion would find themselves heavily engaged in more intense fighting during the first three months of the Great War, as it came to be known, than many of the newly raised ‘Service' battalions would experience during their entire existence. Despite heavy casualties, atrocious conditions, and a steep learning curve, they remained professional and stoic through the early fire and movement battles and then the stagnant, arbitrary nature of trench warfare. They endured pitched battles, heavy shelling, snipers, gas attacks, fended off overwhelming numbers of enemy troops, and carried their bayonets across no man's land into the seething infernos of machine gun and artillery barrages. This is the first part of their story, from their first defiant defense amongst the slag heaps at Mons, through to the ferocious fighting during the Battle of the Somme in 1916. 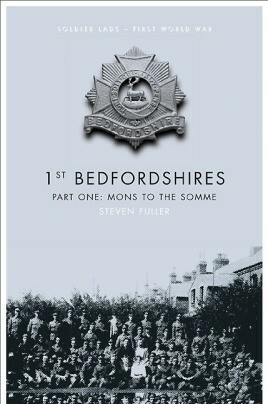 By integrating a wide variety of official and personal sources, supported by maps, and personalised with individual stories and photographs, Steven Fuller brings the fascinating and extraordinary history of this distinguished battalion and it's‘Soldier Lads' to life.